There is no better way to gift a convenient meal or treat that is a recipe that has been in the family or one that you enjoy yourself to share with others. I love the concept of jars containing dry ingredients that typically require 2-5 steps in order for the recipient to enjoy in typically less than 10 minutes. How much easier can it get? So, here is my favorite five bean soup that can be a great gift for someone who is under the weather, great co-worker gift or even your neighbors. It’s hearty and colorful! Wholefully.com has the perfect recipe. Another all-time favorite is this single glass hot chocolate and they have provided free printable tags. Howdoesshe.com has the yummy recipe. So, we did the math. Food jars can be typically made for under five dollars each; the cost of vent latte. 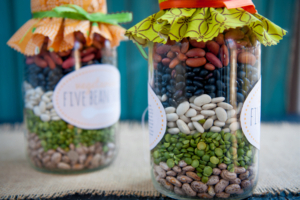 For instance you can purchase the mason jars and the cost of the beans and spices and make four of these for under four dollars! I repeat, four! Doing a hot cholocate recipe can be just under five dollars depending on how fancy you get with the cocoa and chocolate chips. Remember, Saving Grace Chicago is always at your service providing personal and business concierge services and providing lifestyle tips and tricks to make your life more productive.